The sixteen year four month career of D5132/24132 was spent allocated only to Scottish Region depots. Built: BR Derby Locomotive Works (batch D5114 - D5150). Shortened fuel & water tanks. Scottish 'Highland' modifications: twin headlights, tablet catcher, cantrail water filler sheeted over, winterisation features: boiler room grille, gangway door weatherstripping, headcode box weatherproofing. Battery Isolating Switch Cover modification (one hinged door). Time between withdrawal & scrapping: 1 months. November 1975 to to store (serviceable). After withdrawal 24132 was placed to store, being noted at Eastfield on October 20th 1975 (though one source says stored at Inverness from October 1975 to February 1976), then moved to Glasgow Works but was quickly forwarded to Doncaster Works on February 6th 1976 and broken up by March 1976. Movement: 24132 Glasgow Works – Doncaster Works February 6th 1976. 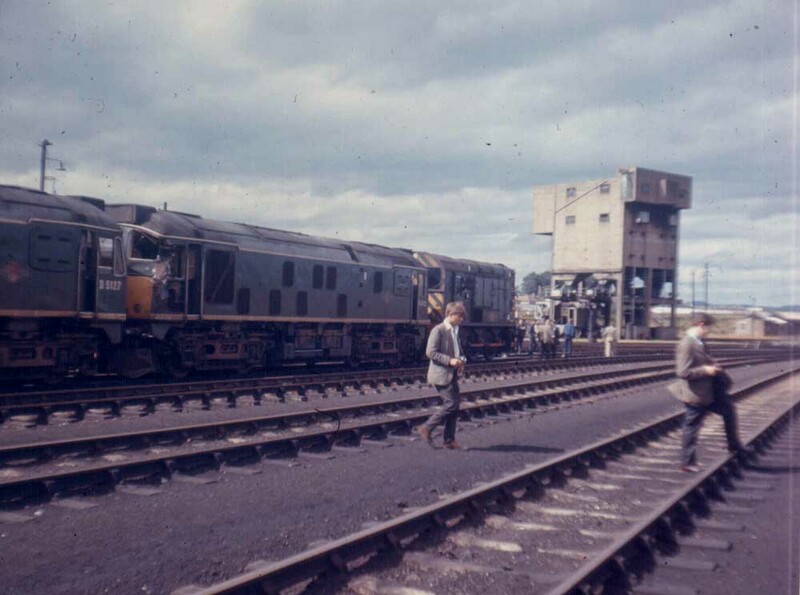 Noted Inverurie Works September 1967. Noted Glasgow Works March 1969. Noted Glasgow Works August - October 1974 (fire damage). D5132 was the last of nineteen Class 24s built by Derby Locomotive Works for allocation to Inverness. The first, D5114, had been delivered five months earlier on April 23rd 1960. 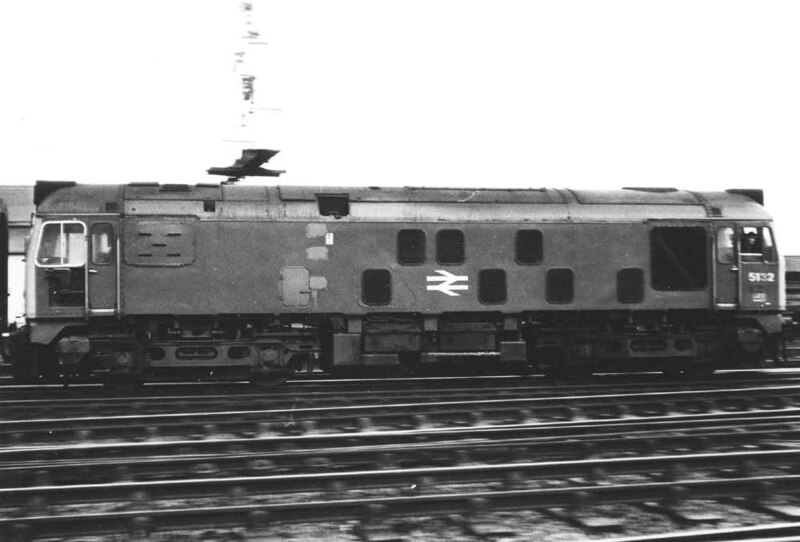 The remaining Class 24s under construction were destined for LMR and NER depots. Photograph courtesy M Patterson, collection of webmaster. Perth depot on August 17th 1967 finds D5127, D5132 & D3541 on shed. D5127 sports the blanking plate with four slits in it, whilst D5132 is on its way to the Works for repairs to the No.1 cab. Condition October: green livery with small yellow warning panels, curved upper corners, bottom of panel covers frame level stripe; gangway doors in place with heavy weatherstripping, tablet catcher equipped, headlights fitted, steam style shed plate on cabfront, shortened fuel & water tanks, blanking plate fitted (five slats). Condition October: blue/yellow livery, gangway doors in place with substantial weatherstripping, substantial weatherproofing on headcode box glazing, headlights fitted, steam style shed plate on cab front, blanking plates fitted (five slats), hand/footholds sheeted over, cantrail water filler not sheeted over, shortened fuel & water tanks. Condition January: blue/yellow livery, tablet catcher fitted, blanking plates fitted (five slats), hand/footholds sheeted over, cantrail water filler not sheeted over, shortened fuel & water tanks, modified battery isolation switch cover - vertical hinge, three-rung bogie mounted footsteps, ridge sided sandboxes. Photograph courtesy Alisdair Taylor. A fine panned shot taken in January 1972 of 5132 passing Inverness depot with a service from the Far North Line. Once passed the depot the train would then back into the platforms that serviced the southbound services, providing connecting passengers with easier access to the trains to Aberdeen, Edinburgh or Glasgow. Condition June: blue/yellow livery, gangway doors sheeted over, headlight fitted, tablet catcher recess present, three piece miniature yellow snowploughs fitted, shortened fuel & water tanks, fuel tank fitted with circular gauge, three-rung bogie mounted footsteps, ridge sided sandboxes, blanking plates fitted (five slats), hand/footholds plated over, cantrail water filler not sheeted over, weatherproofed headcode box glazing. Photograph collection of webmaster. 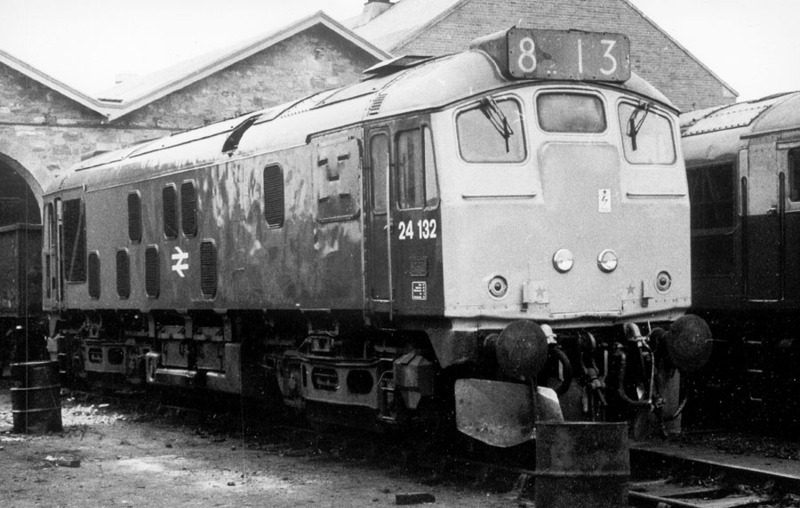 24132 at its home shed of Inverness, date unknown. The strengthened headcode panel is clearly visible, the rubber sealing of the original type now replaced by more serious weatherproofing. 24132 was withdrawn on February 2nd 1976. A builders plate from 24132 sold on ebay during April 2011 for GBP180.99. Page added July 27th 2016. Last updated May 18th 2018.